So, you’re considering implementing a B2B eCommerce site. It can be intimidating for sure and there are a lot of moving parts, but if you plan the project well it can be a straightforward process. While the project may not be a piece of cake, we’ve found that breaking it down into a few crucial ingredients is a great way to whip up a successful B2B eCommerce site. 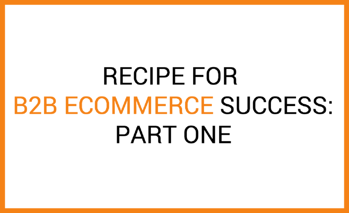 Here are our 13 ingredients for B2B eCommerce success. The first ingredient you need for a successful Magento B2B site is a project champion. A B2B eCommerce project will touch almost every part of the organization: sales and marketing, operations, finance, and, especially, IT. Just as a kitchen has a head chef with sous chefs helping along the way, your project needs a dedicated leader. There needs to be a champion for the B2B site within the organization to drive the project forward. This designated project leader will ensure that the platform is nurtured and continues to grow once it has been launched. The role of project leader and, eventually, B2B eCommerce champion, requires someone experienced in conventional sales strategies as well as digital tools, social marketing strategies, and leveraging those skills in a B2B environment. No one can do this job successfully without a background in technology and, ideally, marketing communications and marketing technology. Some of these key traits will depend on your goals for the Magento B2B site. Is this site going to be an automated inside sales rep? If that’s the case, you’ll want someone who is focused on efficiency and operations. If you’re using your Magento B2B site to grow new business, you’ll want the candidate to be marketing focused. Perhaps most importantly, an eCommerce Manager must be an effective leader who can create relationships with other departments in your organization. Throughout the implementation and post-launch, the project team will need support from marketing, sales, finance, operations, and especially IT. Your eCommerce Manager should be a savvy negotiator who can garner support from the other departments, which will ensure the success of both the initial implementation and the entire B2B eCommerce initiative. As our team is fond of saying, “There can only be one number one priority.” If your team does not have someone whose number one priority is the site, then no one’s number one priority is the site. Without constant attention and dedication, your B2B eCommerce site will fail. While each of these three things is important, one has to be the number one priority. This will help you focus your project. For example, if your main objective is to increase revenue, you’ll want to hone in on the marketing capabilities and campaigns of your new site. If you wanted to decrease costs, then automation through integration with your back-end system will be the project focus. And, if customer satisfaction is your top priority, then the user interface and customer experience will be of the utmost importance. Again, all of these are important, but you’ll need to pick one as the top priority. Most B2B clients we work with focus on decreasing costs through integration and automation. We had two separate customers that are great examples of how to identify your number one project priority. The first, a distributor of accessories for emergency medical equipment, wanted to focus on customer satisfaction for their B2B eCommerce site. How did they determine that was their top priority? They listened to their customers. This client was hearing things like “I wish it was easier to do business with you,” and “Your website is hard to use,” from their customers. So, they adjusted their site accordingly and are now bringing in over $1 million a month online. Similarly, we had an international client who was having ordering issues with their sales staff. This company works in the beef and dairy cattle reproductive industry and has customers in countries all over the world. Their customers used to order over the phone from a member of the sales staff, but things like language barriers and human error lead to order inaccuracy and frustration among the sales team. By focusing on integration and automation, this client was able to reduce order errors and returns, which led to a significant increase in revenue and sales efficiency. Alternatively, we had another client who didn’t listen to their customers or sales team when identifying their top priorities for their B2B eCommerce site. This client, a manufacturer and distributor of emergency services supplies, focused on their own needs before their customers, which resulted in an issue with shipping prices. There is no transparency into shipping costs online, which made their customers unwilling to buy from their new B2B site. Because of this, they had a beautifully integrated B2B site that customers weren’t using, leading to a significant decrease in revenue. So, when it comes to identifying your priorities for your B2B eCommerce site, keep in mind what will make the user experience more enjoyable for your customers and/or sales team. There's more to come! Stay tuned for part two.